The three Navy SEAL snipers who killed the pirates off the coast of Somalia last weekend were lucky the buccaneers were gullible enough to allow their lifeboat to be towed farther out to sea by the U.S.S. Bainbridge. The shortened towline turned what could have been a trio of difficult shots across hundreds of yards of ocean into relatively easy 30-yd. pops. It's a safe bet future pirates won't be so naive. But the Pentagon is drawing up a project to make it easier to hit targets at much longer distances: a super-sniper rifle called the EXACTO, short for EXtreme ACcuracy Tasked Ordnance. In November, DARPA awarded Lockheed Martin $12.3 million and Teledyne Scientific & Imaging $9.5 million to begin work on the new weapon. If various technical hurdles are cleared, it could be available sometime around 2015. Army Captain Keith Bell, former commander of the Army sniper school at Fort Benning, Ga., can't wait to get his hands on the new rifle. "The EXACTO would be revolutionary," he says. "It will more than double our range and probably more than double our accuracy." Current sniper rifles can regularly hit trucks at 2,000 meters, but not bad guys. (The record kill is 2,430 meters, just over 1.5 miles. It was charted by Canadian army corporal Rob Furlong against a Taliban fighter in Afghanistan's Shah-i-kot valley during Operation Anaconda in March 2002  but his first two shots missed.) "There's no limit as far as I can see so long as the bullet's stable  I think 2,000 or 2,500 meters is very attainable," Bell says. "Right now, anything past around 800 meters is an extremely tough shot," he added during a satellite telephone interview from Mosul, Iraq. "But this EXACTO will take the effects of wind, elevation and humidity all out of play." Bell spends his days training Iraqis as snipers and for other elements of the martial arts. 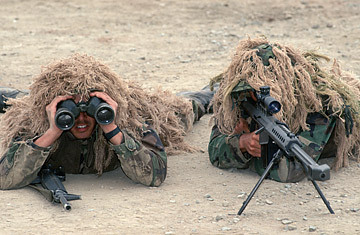 Did he hear about what the Navy snipers did on Sunday? "Sure did," he said. "I'm jealous as hell." See pictures of an ammunition plant.